However, that same widespread application has called into question just how effective a tool blogging is in today’s market. With millions of blog entries uploaded each day, some may believe that such pervasiveness has diluted the ability for companies to reach their intended audiences. After all, so many voices shouting in unison could conceivably make it difficult to communicate a singular concept. 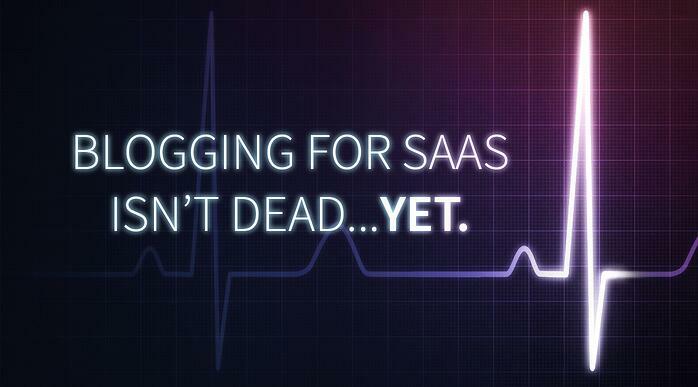 Yet, despite its ubiquity, blogging for Software as a Service (SaaS) products (as well as for many others) remains a worthwhile venture; and I'll tell you just why that is. Even more than most business models, a SaaS company relies on the strength of its information to succeed. Although securing subscriptions with prospects may be a key goal, what will really help your business soar is the information you have at your disposal and how you choose to disseminate it. Many companies have created popular blogs to support their products and see these efforts blossom into some of the most trusted sources of information on the Web. HubSpot, for instance, has become known as a key resource for sales and marketing data, but in actuality, the company’s site is designed to ultimately lead visitors to a greater familiarity and interest in its very own software. Likewise, though the shape and future of blogging has adjusted to accompany changing technology, blogging for SaaS can still help you to develop an online presence that has a tangible effect on your business. Fuel Inbound marketing: Inbound marketing has long played an integral role in SaaS marketing efforts, and few forms of content are more useful in driving traffic to your site than an informative blog tailored to the specific kind of users your business targets. Along with social media posts, email newsletters and other efforts, blog posts can propel your business goals forward in a cost-effective way that allows you to shape the user experience. Boost customer success: Just as blogging for SaaS can boost the amount of visitors your site regularly receives, this approach can prove to be an essential step in guiding prospective customers to become engaged in your business. Providing useful information that leads readers (hopefully) into seeking out all that your product has to offer is perhaps one of the best ways to take prospects from a state of awareness of what your business can do to considering a commitment to your product. Become an Influencer: Whether a guest post on an external site or an entry on your company’s own website, blogging builds your company’s online presence and, in the process, establishes the knowledge and expertise you possess with regards to your industry. Such activity positions you as a key influencer of your field and a perceived authority, building trust with prospective customers and business partners alike. Keyword analysis: Analytics designed to capitalize on popular keywords can provide the insight you need to craft blog entries that deliver the information your prospects need. While we caution against applying notable keywords to an unrelated post, keyword research can guide your topic selection, including the development of quality evergreen content. Buyer personas: Without a thorough understanding of your customers, your blog content won’t be able to connect as viscerally. That’s why it’s critical to acquire detailed buyer personas before you put significant effort into developing targeted blog content. Then you can bear this end user in mind when you decide to which topics to devote resources. Social media: Social media sites like Facebook and Twitter make it easier than ever to keep your pulse on what your target audience is talking about. Trending topics are an excellent resource to consider when brainstorming potential blog entries as well as to ascertain the general conversation regarding a given subject. Such research can often even help direct the storytelling approach you take with the content you produce. Customer development data: Whether you realize it or not, the data you collect during your customer development process can often be useful in deciphering the obstacles and challenges your users face. Future blog entries can delve into how they can overcome them and open up a whole new venue through which you can pull potential topic ideas, making it that much easier to form a sustainable content calendar based on the data you glean. There’s no telling what the future may hold for SaaS business, but just as the industry continues to evolve, so too must the way you approach marketing your business. Blogging is still an instrumental way in which you can attract and retain your customers, as it goes a long way toward demonstrating the vital information you and your business bring to the table. As part of a calculated marketing strategy designed to maximize the impact you make on your target customers, blogging for SaaS certainly has proven benefits that you’d be wise to incorporate into your business.